Israeli Prime Minister Benjamin Netanyahu called Sunday on the White House to recognize "Israeli sovereignty" over the Golan Heights in a joint statements with U.S. National Security Advisor John Bolton in Jerusalem. The statements were part of Bolton's trip to Israel which started on Saturday. Netanyahu said that he had raised the issue with the U.S. President Donald Trump. 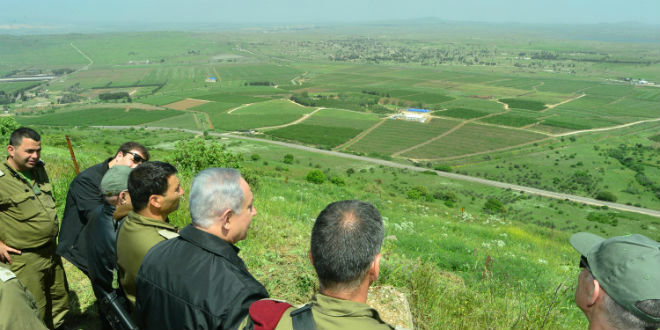 "Tomorrow (On Monday), if weather permits, we'll go up to the Golan Heights," Netanyahu said, adding that the territory is "tremendously important for our security." "I think that when you're there, you will be able to understand perfectly why we will never leave the Golan Heights," he added. Israel occupied the Golan Heights from Syria in the 1967 Middle East war and annexed the territory in 1981. Bolton arrived in Israel for talks with officials that focus on the Iranian military presence in Syria in the wake of U.S. President Donald Trump's announced plan to withdraw from the war-torn country.